Mike Kiely, the author of a document that sought to describe BT’s proposed fees for rolling out fibre to the cabinet broadband in rural areas, was sacked by the department of culture media and sport following the publication of details of the paper on this blog, according to the person who gave me a copy. 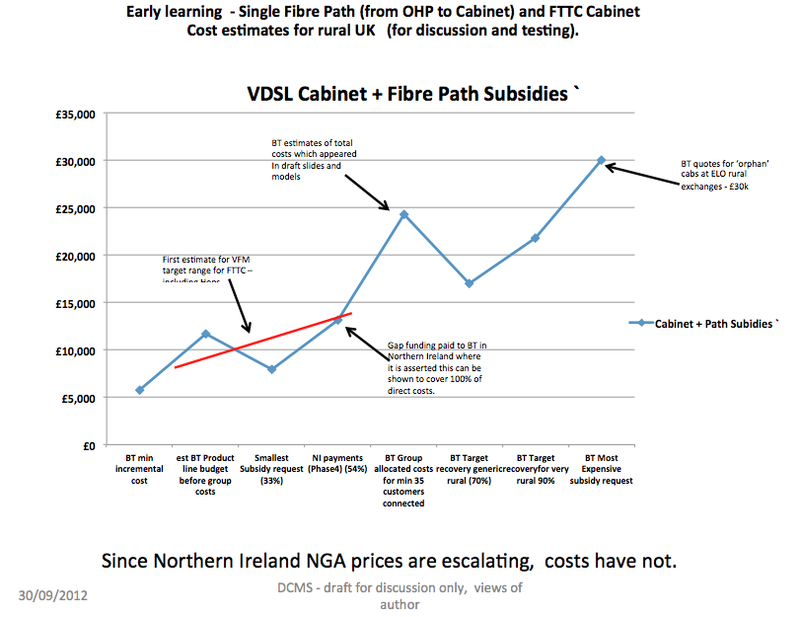 Following the blogpost, a DCMS trawl of internal emails revealed that Kiely had sent his discussion document to people in local authorities that are preparing to buy next generation broadband (NGA) services under the BDUK procurement framework. His apparent intention was to give them the ability to question BT’s price proposals, which he believes are inflated. DCMS said it does not comment on matters that affect individual staff. Prices rise, but costs don’t in BT’s divide and conquer NGA strategy. description of BT’s proposed pricing model in detail. Nor is he the person who gave me his document. There seems little doubt that he acted from principle. He is well-respected by those he dealt with as BDUK’s linkman between communities desperate for better quality broadband and BDUK. His contribution to helping remote communities in Cumbria prepare NGA plans is noted in evidence to the House of Lords’ communications committee investigation into UK broadband. Kiely’s actions seem related to the increase, surprising in the light of the government’s overall debt, in the total amount of money available for NGA projects, and the lack of competition for it. The government said initially it was putting in £530m for NGA in rural areas, plus potentially £300m in the next parliament. Robert Ling, the BDUK projects director who, in a unrelated move, quit and left a week before Kiely was sacked, was largely responsible for persuading local councils to match the central government contribution. This, plus extra money from the European Commission and Defra, plus £150m each for “Superconnected Cities” and mobile network infrastructure in rural areas has pushed the total up to around £1.5bn. This extra money appears to have caught BT unprepared. Kiely’s document shows that he suspects BT is inventing tasks and charges to soak up as much as possible of the extra money without having to do more than it first planned. Meanwhile, an informal BT quotation in March this year estimated the cost of upgrading a remote PCP in the Leeds area at £10,000. This was later withdrawn by Openreach CEO Olivia Garfield who told the prospective customer to give her his phone number. BT would then assess potential speeds availabile via FTTC and FTTP. “I will again ask (one of her staff) to kindly provide you a ball park quote that you would need to raise (either locally or from the council) and a committed take up rate %. We have a number of communities across the country who have managed to make this work, and well done to them,” she wrote. Up, up and awaaaay! BT piles on the charges, without explaining how they arise or when they are due. Kiely’s document notes that since the main Northern Ireland roll-out, which finished in July last year, prices for rural cabinets appear to be rising, even though costs are declining. Stewart went on to say, “Two years ago, my neighbour in Dufton was being quoted £45,000 to get a broadband connection in his home. The model of this parish pump approach has now reached the situation where any community in Cumbria that wanted to ought to be able to get it for a cost of £500 or £600 a home. “For a relatively small sum of money—£60,000—hundreds of people around Great Asby will be able to get superfast broadband (via FTTC).” This is understood to be for two cabinets in Great Asby, a sum Kiely believes is inflated. It is hard to establish true costs because BT does not disclose them, and requires interested parties to sign non-disclosure agreements, the HoL committee heard. This means neighbouring councils are not able to exchange information that could help to harmonise and optimise roll-outs, lowering costs. Separating each procurement allows BT to mask such efficiencies to the outside while taking advantage of them operationally. It allows BT to hide economies of scale, such as volume discounts, as well as any labour-saving techniques it learns or develops from the experience of rolling out the new cabinets. There appear to be other costs that BT is trying to build into a “standard model” rather than rely on actual costs. Kiely’s description of BT’s model identifies “Planning costs”, “Availability charges” and “Take-up bonuses”. These can double the taxpayers’ liability for a project. BT did not respond to a request to explain how these costs arose, what the rates are, or when they fall due. However, @BillBroadband, which is believed to be the Twitter identity of Bill Murphy, the man in charge of BT’s NGA project, said these charges are “standard approach”. He declined to provide further detail. A look at the Openreach website for high speed broadband prices was not illuminating. Other sources close to NGA procurements question even BT’s basic costs. They say FTTC is an overlay on BT’s existing telephony network, therefore planning costs are negligible, as is the civil engineering needed to install and connect new cabinets because the ducts, the biggest cost of a new deployment, are already in place. Kiely’s document suggests that BT is keen to develop an abstract model of charges that hide its actual costs and therefore profitability. By releasing it to NGA buyers he was giving them information they could use in negotiations with BT to ensure that taxpayers’ money was used to best effect. While DCMS evidently regards Kiely’s actions as above and beyond the call of duty, they seem motivated by a spirit of civic concern. In that light, his sacking seems harsh. DCMS should have applauded rather than condemned him. In any case, this episode may be only a footnote to the NGA story. The European Commission’s DG Competition may still decide that money dispensed under under the BDUK framework does not meet state aid guidelines. That decision is expected within days. This affected their ability to apply for funds from Defra’s Rural Community Broadband Fund because they had to show that the money required was less than 50% of the cost of the project, and that the area covered by the project fell outside the county’s proposed coverage area, i.e. in the “last 10%”. Mike was too honest. They had to get rid of him. Some civil servants do not like to hear the truth. Yes Minister doesn’t either. BT’s vital vision. Divide and Rule. Embrace, Extend, Extinguish. Well, he needs a job. Let’s try and get it back for him, if he wants it. Or find him a better one. If you click on the graph it opens up bigger. I did that, it still doesn’t say. Would be better as a bar chart I suspect, but still needs dimensions on the axis ! £ per cabinet ?? at what size / takeup etc. Hmm. Odd. It is �/working cabinet, but you’ll need to ask BT or Mike Kiely about what’s inside. Shocking. Mike Kiely seems to have sadly paid the price for his honesty. I hope this situation gets looked into more deeply as things mentioned here are just not right. It would be good if BT responded to these claims stating the figures, and proving the above untrue, but I guess that hasn’t happened hast it? Which if it hasn’t raises even more questions. 4. Are the charts created by Ian, or are they actual BDUK charts, as the DCMS -draft for discussion part suggests they may have been lifted from BDUK documents. 6,. Has Ian done any analysis on how the prices for BDUK projects relate to money Openreach spending in the pure commercial areas, to check no cross-subsidy is happening. Those aren’t questions I can answer Andrew. Ian would have to respond. I was just commenting on the article which you seem to suggest is mainly an anti BT theme. One would assume that with words so strong in the article that Ian would have done his research before publishing and have some solid sources. Again, he’d have to comment on that. 1. Deployment costs vary across the UK Then why is BT apparently trying to establish a standard price? 2. No two parts of the UK are identical, particularly once outside the cities. Your point being? 3. BT is still investing its own money even in areas where it appears to get more subsidy per cabinet Not clear what point you are making. Presumably the shareholders are happy with that..
4. Are the charts created by Ian, or are they actual BDUK charts, as the DCMS -draft for discussion part suggests they may have been lifted from BDUK documents. I did not create these charts. 5. Has Ian chased any of the other operators installing cabinets to see what their costs are, to evaluate whether Openreach is just making up its costs Like BT they regard this as competitively interesting information, so they don’t tell me, even though I do say please. They are not obliged to tell me, but I believe BT is obliged to tell Ofcom its actual costs. 6,. Has Ian done any analysis on how the prices for BDUK projects relate to money Openreach spending in the pure commercial areas, to check no cross-subsidy is happening. See elsewhere herre for BT’s secrecy regarding prices. This analysis is not mine; it is Mike Kiely’s. We should all be grateful to him for trying to establish BT’s actual costs, and perhaps stop taxpayers’ money being spent on unnecessary work. If you are aware that BT is cross-subsiding any of its activities, I believe you should provide Ofcom with the evidence at once, with a copy to parliament. I think BT may have to speak to the Public Accounts committee, if The Telegraph story is correct. http://www.telegraph.co.uk/technology/internet/9579661/British-Telecom-could-be-overcharging-taxpayer-hundreds-of-millions-of-pounds.html Hopefully they will interrogate DCMS about Kiely’s sacking. Which could result in an interesting outcome, that BT just like Fujitsu decides that many of the local authority projects are no longer viable. Maybe there are those with interests that mean this is the outcome that they feel is best. Like those here with shares in ‘altnets’. Martyn, I just clicked the leave a reply at the bottom of the page, and WordPress added my reply to yours. Well if Ian has chased other operators it would seem sensible to use these to illustrate how expensive the Openreach solution is surely. Not mentioning this, leaves it open to the rumour that maybe Openreach is not massively more expensive than the other options. That’s a big time overestimate of the initial costs per cabinet. Have you read Mike Kiely’s work on this matter Andrew? Andrew, you are aware that Openreach are happily enabling cabinets as part of their commercial deployment with less than 400 lines and are assuming a 20% uptake – how much incremental income do 80 lines give even over a 12 year payback period? Do bear in mind that the initial costs don’t include additional line cards, ongoing power costs, etc. If it helps SYDR initial costs per cabinet were less than half the figure you mentioned. BT Openreach should not even be dealing directly with Communities as Liv Garfield seems to be doing. Openreach has customers – they are called Communication Providers (CPs). Openreach should have no commercial relationship with end users or Parish Councils. I wonder if all CPs were canvassed first before the Iwade community received a solution from BT Openreach – was a viable range of CPs interested in delivering DSL from that cabinet? or is the only “CP” delivering a service from that cabinet BT Retail? Did Openreach make the decision to deploy FTTC at that location (and charge the council) without speaking only to BT Wholesale/Retail in advance? After all, Openreach cannot deliver services to end users on that cabinet. It would only be in the spirit of the Undertakings if there was competition between CPs buying the wholesale service from Openreach (NOT a range of reseller CPs buying it from BT Wholesale/Retail). A CP wishing to bring an FTTC service to a community using existing BT infrastructure has a choice to do it using subloop unbundling, or by persuading Openreach to deploy FTTC (NGA). Openreach has a serious conflict of interest between deploying its own FTTC solutions in rural communities and serving its customers (CPs) wishing to do subloop unbundling. 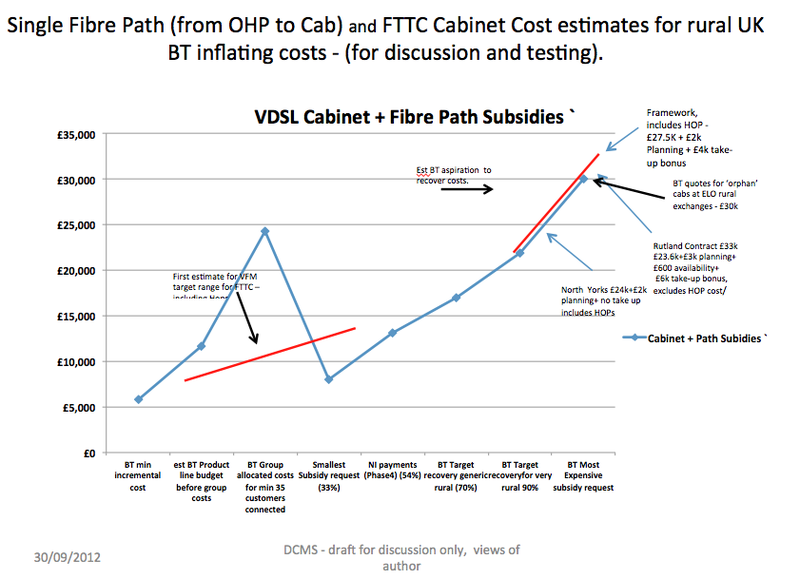 Consider this example to demonstrate the conflict of interest: The fact that Openreach will not even ensure a copper line is capable of supporting VDSL2 in SLU (where a CP, an Openreach customer, wants to deliver VDSL) vs the lengths it goes to when delivering its own FTTC service to an end user, supposedly on behalf of a CP (usually BT – which is also part of BT PLC). I believe Openreach makes absolutely sure that the latter works! I once asked a Director of Openreach if legally their loyalties were to BT PLC shareholders first and foremost as opposed to the interests of competitors to BT PLC, like SLU CPs. Of course she could only give one answer! The sacking of Mike Kiely is a total disgrace. The more that BT Openreach tactics are exposed, like these alleged inflated and disguised costs for FTTC, the better IMHO. Look at it another way – if a Parish Council decided to set itself up as a CP and registered with Openreach for SLU, it could request the relevant parts from Openreach (apart from the cabinet, DSLAM etc) – like fibre back to the exchange and the tie cable, at published and regulated cost. It coudl source a cabinet and DSLAM from a variety of competitors. But since Openreach itself is pitching to such Parish Councils itself, and quoting them, surely it has a conflict of interest? It is potentially competing with the CP which is supposed to be its customer! Ofcom were crazy to allow BT Openreach to deploy FTTC. I said so ages ago. Only now can it be seen that we are back to a monopoly situation – with BT Openreach controlling its own prices and communities left without choices via BDUK. FTTC (NGA) should have been done via BT Wholesale consuming the Openreach subloop unbundling product, with regulated costs. Then we would have a more level playing field, and, more importantly, greater transparency of costs for rural communities to consider. The Iwade FTTC service is available from any ISP using Openreach services, surely ? Certainly the phone number on http://www.iwadevillage.co.uk/services.aspx?subnavid=42 can access them. Do all FTTC ISPs have service available everywhere? Iwade is part of Sittingbourne who have the likes of Sky, TalkTalk etc. Pointless installing FTTC if there will be no customers, which is exactly why the rollout is what it is. How many SLU sites are there? Probably not worth it for the relatively low number of customers paying as little as possible for broadband. I can’t see parish councils wanting to be CPs, more important things to sort out. ” Then why is BT apparently trying to establish a standard price? ” – presumably because the way BDUK went about its procurement with a “Framework” of fixed price menu options this is what they were being asked to do ? Perhaps BT likes it like that, and encouraged everyone to see things its way. Not that anyone could possibly comment. Creative Accounting Scandal: British Broadband Subsidy Helps BT’s Bottom Line; Whistleblower Fired | Stop the Cap! the labrynth that was and will always be, working within the walls previously i have heard such stuff you would not believe and speaking out before would of seen me on my way if i liked it or not. The most rediculous quote i ever had was in excess of £500,000 to upgrade a cabinet (PCP) which reduced to a little over 10k when challenged. Well as BT Openreach have no real competitors they have a total monopoly quoting Councils who have no idea if a telephone cable should cost 50pence per metre or £500 per metre. And who do they turn to for advice on these costs but Openreach. It is a dirty business and taxpayers money is being sucked into a BT blackhole. I was involved on a project where such things went on. In the end we got a £10 k quoted job doe for £600.